Back in September, Inhabitat took a tour of Long Island City’s art and cultural centers, which are part of the 72 Hour Urban Action initiative to save LIC from expanding gentrification through artistic and economic development. But for one of these historic cultural landmarks, it may already be too late. 5 Pointz, a sprawling graffiti mecca, is set to be torn down in 2013 in order to make room for some not-so-cultural and not-so-historic high-rise luxury condos. Demolishing the building would not only destroy a cherished landmark that attracts artists from around the world, but it could also have serious social consequences for the neighborhood. An old abandoned warehouse just off the 7 subway line, 5 Pointz spans an entire city block, attracting graffiti artists, hip-hop stars and tourists from all over the world. Last March, however, Jerry Wolkoff, the owner of the property, announced plans to demolish the buildings, making 5 Pointz another victim of gentrification and the condo development craze. Artists and community activists however, aren’t letting this slide. Not only are they chastising the destruction of one of the most important hip-hop landmarks in the country, but artists and activists are also warning of serious social epidemic, which may arise from tearing down 5 Pointz. The problem arises from the fact that walls where artists can spray-paint legally are almost non-existent in NYC — but 5 Pointz is an exception. There is also growing concern that by leaving young graffiti artists with nowhere to express themselves, many will turn to tagging the streets and subways, resulting in a wave of vandalism. “It would be a travesty in this neighbourhood,” said graffiti writer Gwiz in an interview with The Guardian. “A travesty for the community. This is the history of hip-hop, with the music and the break dancing and the art… You would destroy a piece of history.” Gwiz points to an entire display of names of dead writers, legends of New York’s graffiti scene spray painted in pink bubble script along the top of the warehouse. When we last visited 5 Pointz, Meres One, 5Pointz curator since 2002 took us through a tour of some of the museums most famous pieces, including his own Batman and Joker display near the warehouse entrance. He discussed the need to preserve cultural landmarks like 5 Pointz in light of gentrification and talked about the historical significance of 5 Pointz, both to NYC and graffiti artists throughout the world. “They come from Italy, Germany, Russia, Spain – all over,” said Meres One to The Guardian. “In the summer, you have DJs and break dancers and freelance MCs. 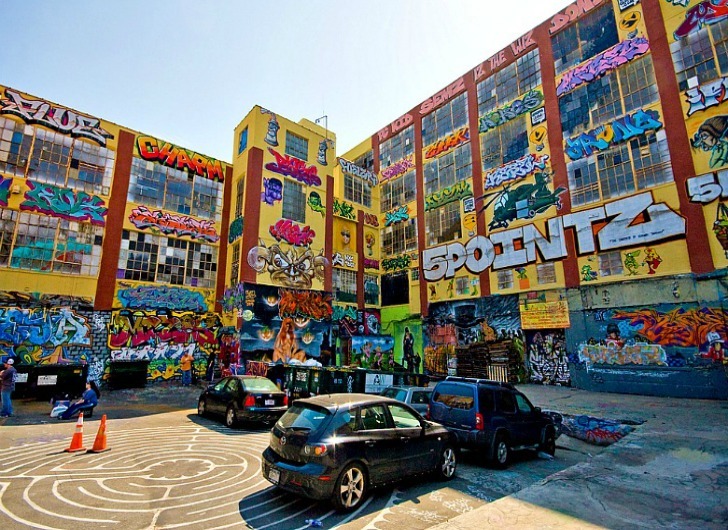 It’s not just graffiti.” During the summers, up to 110 artists create and showcase their work at 5 Pointz. One reiterated concerns that the end of 5 Points will create a wave of vandalism. “What I’m doing is offering an outlet, and while they are here they are not doing it elsewhere,” he said to The Guardian. For those of us who’ve lived in NYC during the ’80s and ’90s, the prospect of widespread city vandalism isn’t a far-fetched reality. Today most subways and buildings are devoid of any graffiti because of strict anti-vandalism laws, but that may not be enough to stop a new generation of artists looking for a creative outlet. Despite what many consider to be the end of 5 Pointz, there may be hope yet to keep this important landmark alive. During the 72 Hour Urban Action initiative, we also spoke to Councilman Jimmy Van Bramer who represents the LIC district. “People should be able to live in a city with sustainable, local economies that help maintain the cultural layers of the community’s local identity,” he said. Activists should pressure local politicans to petition for 5 Pointz to be designated a historic landmark. © Special KRB. Flickr Commons.